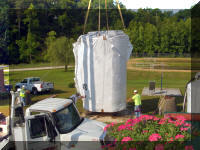 Raccoon Creek Water Treatment facility is a conventional surface water treatment plant. We withdraw waters from the creek and process through flocculation, sedimentation and filtration. Our finished product is a high quality drinking water with turbidities in the range of .030-.050 NTU. The state standard is .3 NTU. Raccoon Creek Plant is capable of producing up to 5.5 MGD. Our withdrawal permit is limited to 3.00 MGD, with a monthly daily average of 2.5 MGD. Additional water supply for this plant would be needed for future growth. The reservoirs storage capacity is 4.00 MG. Storage capacity at this plant is .6 MG.
Lowe Springs was placed into service November 2003. 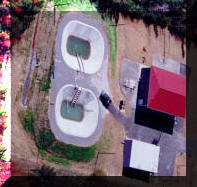 Water is pumped directly from the Spring , filtered, after the addition of chlorine and fluoride the water is pumped into the distribution system. The Spring consistently produces high quality drinking water and contributes 500,000 gallons per day to our potable water supply.